Is it preference or accuracy that is evaluated? Loudness Controls and Tone Controls – Do They Work, Are They necessary? What Is Acceptable Background Noise? Phase and Polarity – Do We Hear Waveforms? Chapter 5: Characterizing Loudspeakers – Can We Describe What is Good? Identifying the Important Variables – What do we Measure? Why do we measure what we do? Are there better ways? Predicting Room curves From Anechoic Data – An Exercise in curve Matching. Why Do We Care About Room Curves? Floor Reflections: A Special Case? Optimizing Room Dimensions – Does an "Ideal" Room Exist? Are Non-Rectangular Rooms the Answer? 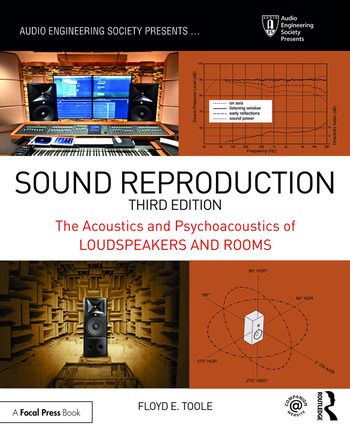 Mode Manipulation For Any Room Using Multiple Subwoofers and Signal Processing: Sound Field Management (SFM). Do we Hear the Spectral Bump, the Temporal Ringing, or Both? Bass Management Makes it all Possible. Is there a more useful metric for our purposes? Alternative targets – is it time to move on? The wrong room curve target? "Room correction" and "room equalization" are misnomers. Is there a common factor – a generalizable target? Measures of loudness and system level calibrations. How many loudspeakers and where? Optimizing the delivery of "envelopment"
Floyd E. Toole is a consultant for Harman and a Fellow of the AES, the Acoustical Society of America and CEDIA, and is in the Consumer Technology Hall of Fame.